Who ditched Telangana cannot be welcomed here! It’s very sad that a women leader has been shoed away in the hot bed of Telangana. But no way, T people disgusted by the volte face of YSRCP and it’s changing tones. Honorable Vijayamma, with holy Bibile in the hand, pledged solidarity with Telangana sentiment and expressed condolences to the martyrs of Telangana. But now she announces in Seemandhra borders that Telangana will not be formed and proceeds to Nalgonda. How can a party or a leader be welcomed in Telangana, after ditching and cheating so many times? Author kattashekarPosted on October 31, 2013 Categories Political CommentaryTags Honorable Vijayamma, telangana1 Comment on Who ditched Telangana cannot be welcomed here! G Gangadhara Rao’s “Hyderabad and the Bifurcation of Andhra Pradesh” (EPW, 19 October 2013) presents interesting data on the implications of the creation of Telangana for the revenues of the new Andhra Pradesh (AP). The problem is that the data is published district-wise. The author has compounded this problem by adding the revenues of Rangareddy district to Hyderabad district which produces a total revenue figure of Rs 37,556 crore for 2012-13. First, the extent of Hyderabad city has to be defined. The revenue district of Hyderabad is 217 square kilometres (sqkm), the Greater Hyderabad Municipal Corporation (GHMC) 626 sqkm, the Hyderabad Urban Development Authority (HUDA) 1,348 sqkm and the Hyderabad Metropolitan Development Authority (HMDA) a massive 7,073 sqkm. One selects what one likes. But the revenue figures presented are for the revenue district and more or less cover the GHMC. Most of the state’s own tax revenue (such as sales taxes, stamp duties, transport tax, excise, mineral royalties) is based on location and for Hyderabad amounted in 2012-13 to Rs 11,730 crore out of the state total of Rs 51,441 crore. However sales taxes are based on location of the registered offices of the payer. By virtue of Hyderabad being the capital of the state, many manufacturers/distributors have registered their offices and are paying sales tax for their statewide sales to the Hyderabad division of the commercial tax department. These division-wise figures for commercial taxes are available and they indicate that in Hyderabad city (GHMC) the sales tax paid in 2012-13 was Rs 8,960 crore. Of this, nearly Rs 3,000 crore is estimated to be the sales tax paid by petroleum companies and AP Beverages Corporation Limited (APBCL). These entities pay taxes on sales in the entire state at Hyderabad and, as such, the sales to Seemandhra on division of the state will become interstate sales and attract central sales and will be transferred to the consuming state. More likely, the companies and many others registered in Hyderabad will set up offices in Seemandhra and pay taxes there. Some part of this will automatically flow to Seemandhra. Hyderabad city has huge costs. The GHMC budget for 2013-14 alone has a total outlay of Rs 3,800 crore, including revenue expenditure of Rs 1,529 crore and capital expenditure of Rs 2,271 crore. It receives from the state government assigned revenue of Rs 770 crore and now wants a share of the commercial taxes collected in its area. Hyderabad also has huge commitments towards improving its infrastructure and services. The Telangana state will have to make major financial contributions to GHMC in order to just maintain infrastructural and service facilities, let alone increase them and improve their quality and coverage. Hyderabad city needs 1,000 MW with a peak demand of 1,500 MW of power. It was estimated by the Srikrishna Committee that by 2019-20 it will need nearly 5,000 MW! Already many areas face load-shedding. With the division of the state it will take some time for the new Telangana grid to adjust and cope with the new situation. With a common capital, is this power going to be shared by residual Andhra Pradesh or the central government? As it is, the state has to enforce power restriction in the hinterland to supply Hyderabad with what little power it provides today. As of now the residents in Hyderabad are supplied water for about two hours on every alternate day through 5,00,809 connections. While the total water supply is 200 million gallons per day (mgd), the average supply is 162 litres per capita per day (lpcd) in the metro areas and only 91 lpcd in the surrounding municipalities in the GHMC area. A huge gap is indicated between current supply and demand, and this is likely to widen by 2021 (in the maximum years contemplated for the common capital) when the estimated demand will double to 400 mgd. The government had accorded administrative sanction of Rs 1,670 crore for taking up the Krishna Phase-III with permission to raise Rs 1,500 crore as loan assistance from the HUDCO with a government guarantee and a balance of Rs 170 crore from the state government budgetary provision. The project to bring Godavari water to the city for drinking purposes would be implemented in three phases. Phase-I with a cost of Rs 4,000 crore is expected to bring 120 mgd water to the city. This has not been taken up yet. Hyderabad is the destination of many who seek a better life. This internal migration both from the hinterland, Seemandhra as well as the rest of the country, will continue. There is no way to stop it despite local irritation and jealousy. A variety of migrants bring cheap labour, hard work, entrepreneurial skill, capital and a migrant’s drive for success. They also require infrastructure and service. Both water and power are in short supply. There are 811 officially recognised slums housing 1.4 million persons. The idea that Hyderabad city is paved with gold is alright as far as migrants and real estate operators are concerned but in no way is Hyderabad city a net revenue earning government entity. In fact it never was. After division and the expected downturn in activity, it will be less so for the Government of Telangana. Hyderabad, engine of “growth”, as it is and may be, will remain dependent on state revenues for the foreseeable future. సంధికాలం. ఎవరూ ఎవరినీ పట్టించుకునే పరిస్థితి లేదు. అందరికళ్లూ ఇటు తెలంగాణపైన, అటు సమైక్యాంధ్రపైన ఉన్నాయి. కొందరు ప్రభుత్వంలోని పెద్దలు, ప్రజాప్రతినిధులు, భూకబ్జాదారులు మాత్రం రెక్కలు విరుచుకుని నగరంపై పడ్డారు. ఎక్కడ ఖాళీ భూములు ఉంటే అక్కడ కర్చీఫ్ వేసి ఇది నాదే అని ప్రకటించుకునేందుకు, ప్రభుత్వంతో రెగ్యులరైజ్ చేయించుకునేందుకు ప్రయత్నాలు జరుగుతున్నాయి. కబ్జా రాబందులు నగరంలో ఖాళీ ప్రదేశాలను తమ గుప్పిట్లోకి తీసుకుని, పత్రాలు సృష్టించి, రెవెన్యూ కార్యాలయాల్లో రికార్డులు తారుమారు చేసి, భూములు సొంతం చేసుకునేందుకు ప్రయత్నిస్తున్నాయి. ఎంపీలు, మంత్రులు, ఎమ్మెల్యేలు, చోటామోటా నాయకులు అందరూ ఉన్నారు. అధికార పార్టీ, ప్రతిపక్ష పార్టీల నాయకులు అందరూ ఈ విషయంలో కలిసే పనిచేస్తున్నారు. దీపం ఉండగానే ఇల్లు చక్కబెట్టుకునే పనిని ఉమ్మడిగా వేర్వేరుగా వేగంగా చేసుకుపోతున్నారు. ఎవరయినా రెవెన్యూ అధికారులు అడ్డొస్తే వారిని బదిలీ చేయిస్తున్నారు. ఈనాడులో ఈరోజు వచ్చిన వార్త అందుకు ఒక మచ్చుతునక మాత్రమే. సుమారు 5000 వేల కోట్ల రూపాయల విలువ జేసే భూములను కాజేసేందుకు కుట్ర జరుగుతోందని ఒక అధికారి ఆవేదన వ్యక్తం చేశారు. తెలంగాణ వచ్చేలోగా ఈ తతంగం పూర్తిచేయాలని కబ్జారాబందులు ప్రయత్నిస్తున్నాయని ఆయన అన్నారు. ముఖ్యంగా బంజారాహిల్స్, జూబిలీ హిల్స్, మాధాపూర్, ఫైనాన్సియల్ డిస్ట్రిక్ట్ ప్రాంతాల్లో ఈ దందా జోరుగా జరుగుతున్నదని ఆయన చెప్పారు. సంధికాలంలో ఎటువంటి భూబదలాయింపులు జరుగకుండా తెలంగాణవాదులు అడ్డుకోవాలని ఆ అధికారి కోరారు. అవసరమైతే కోర్టు నుంచి సాయం తీసుకోవాలని ఆయన విజ్ఞప్తి చేశారు. ‘హైదరాబాద్‌లో అన్యాక్రాంతమవుతున్న భూములపై కమిషన్ ఆఫ్ ఎంక్వైరీ వేసి నిగ్గుతేల్చాల్సి ఉంద’ని తెలంగాణ న్యాయవాద జేయేసీ నాయకుడొకరు అన్నారు. Author kattashekarPosted on October 30, 2013 Categories Political Commentary1 Comment on హైదరాబాద్ లూటీపోతోంది….! The Centre has constituted a high-level committee headed by former CRPF Chief, K Vijay Kumar, to look at the division of assets and the administrative framework which would be required when Telangana is created upon bifurcation of Andhra Pradesh. The committee, which will visit Hyderabad tomorrow, will interact with professionals, State Government officials and government bodies before preparing its report. It will also look at various options regarding the division of assets between the new state of Telangana and the residuary one of Andhra Pradesh, official sources said. “The team’s visit is of an exploratory nature,” a source added. It will submit its report to the GoM set up to look into the bifurcation of Andhra Pradesh. The said GoM, which has met twice, has already held detailed discussions regarding the sharing of river waters, power, distribution of assets and demarcation of boundaries. Headed by Home Minister Sushilkumar Shinde, the GoM has already discussed the approach and methodology to be adopted by it. It will seek the opinions of stakeholders on all important issues while formulating its recommendations, the GoM has said. The terms of reference for the GoM are to determine the boundaries of the new state and the residuary state with reference to electoral constituencies, judicial and statutory bodies, and other administrative units. It will also look into the legal and administrative measures required to ensure that both the Telangana and Andhra Pradesh Governments can function efficiently from Hyderabad as their common capital for 10 years. The panel will take into account the legal, financial and administrative measures that may be required for the transition to a new capital by the residuary state of Andhra Pradesh. వైఎస్సార్ కాంగ్రెస్‌లో పనిచేస్తున్న పెద్దాయన ఇటీవల ఒక ఆసక్తికరమైన వ్యాఖ్య చేశారు. మీరెందుకు జగన్‌మోహన్‌రెడ్డికి దూరంగా దూరంగా ఉంటున్నారని ఒక మిత్రుడు ఆయనను ప్రశ్నించారు. అని ఆ పెద్దాయన సమాధానం ఇచ్చారట. Author kattashekarPosted on October 29, 2013 Categories Political Commentary1 Comment on ‘తెలంగాణ చిచ్చు’రేపిందెవరు? Heavy rains and floods not only damaged crops, but proved division is completed. Major political parties lead by Seemandhra leaders confirmed the division and opted their area of operation. Floods created havoc Adilabad to Srikakulam, Khammam to Prakasham. Farmers every where suffered a lot. Few of them committed suicides after seeing the loss of crops. Adilabad, Khammam and Srikakulam affected by floods not once in this season, but twice. In Adilabad and Khammam 40 mandals are in continuos floods. Recent days Nalgonda is most affected district. But CM Kirankumar Reddy, TDP Supremo ChandrababuNaidu, YSRCP Leader Vijayamma…all are jumped in to tours to console the farmers, not in Telangana, but in Seemandhra. By doing so they have opted their region, means their future state. They simply ignored Telangana farmers and their travails. 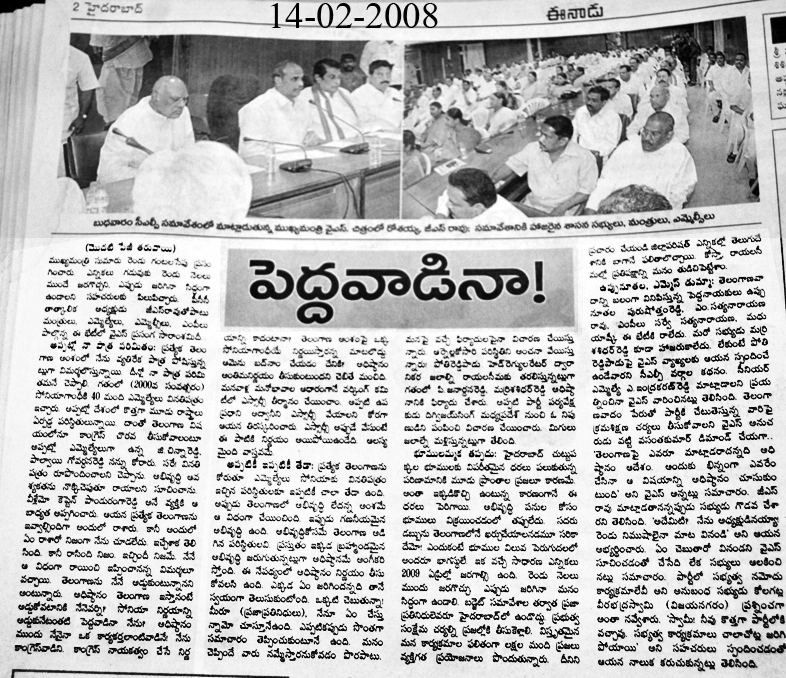 One more aspect to be observed is by championing Samaikyandhra all these leaders got entry in to Seemandhra region. Now they see no resistance. Every leader smacked the other. 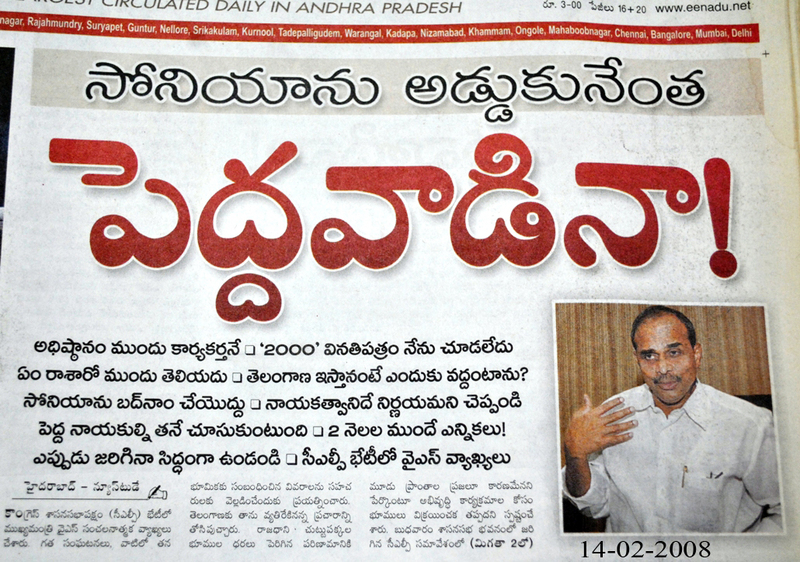 Kiran and his bandwagon accuse that high command compromised with Jagan and dumped them. Jagan accuse that Congress and Chandrababu caused the division. Chandrababu condemned Kiran, Jagan and Sonia that they conspired division against him. Kiran, Jagan and Chandrababu accuse each other that they are working as a ‘covert’ to Sonia Gandhi. Floods cleared the political mud created by these three leaders opportunistic stands and agitations.